Attorneys for Covington Catholic High School student Nicholas Sandmann are suing the Washington Post, seeking $250 million in damages — the amount that Amazon founder Jeff Bezos paid to purchase the Washington Post in 2013. The attorneys stated that they have plans to bring other “wrongdoers” before the court to seek damages in compensation for harm done to the Sandmann family. The defendants are likely to be other media companies and celebrities or public personalities that express threats publicly on the Internet and social media. “This is only the beginning,” the law firm said on a web page introducing a copy of the the plaintiffs’ complaint in the United States District Court, Eastern District of Kentucky Northern Division at Covington. Sandmann, along with other students of Covington Catholic High School, was in Washington D. C. on January 18, 2019 for the annual March for Life rally. Sandmann was wearing a red Make American Great Again (MAGA) hat. 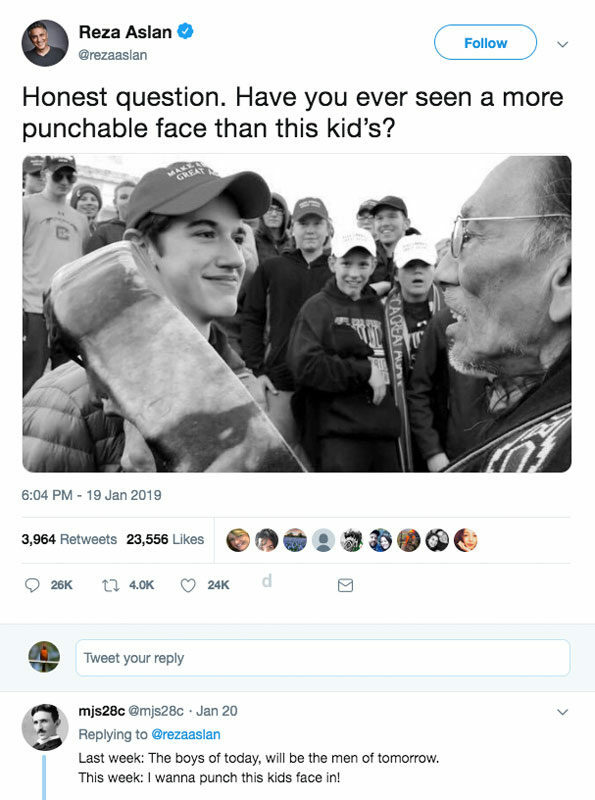 In a video that was edited to make it appear that Sandmann was the offender, Sandmann was portrayed as a smirky punk that was in an encounter with an innocent Omaha tribe elder Nathan Phillips. Several hours later, full unedited videos were released by other sources that showed that Sandmann was standing in position when Omaha tribe elder Nathan Phillips walked up to Sandmann, beating a drum and chanting loudly within inches of Sandmann’s face. Nathan Phillips was a complete stranger to Nick Sandmann, and Nick Sandmann had no way of knowing or predicting whether it was safe to stand there while Nathan Phillips was waving a stick inches from his face. Nathan Phillips had already been playing a drum and chanting at the Indigenous Peoples March at the Lincoln Memorial on the same day before he walked over to confront the Covington Catholic High School students, selecting Sandmann especially … for some unknown reason. Reza Aslan Punchable Face of Nicholas Sandmann tweet. Aslan is a religious studies scholar, TV producer and host. The first video had already gone viral, effecting widespread accusations of bigotry as photos of the teenager were shared on social media. In the second video, a group of black men who identify as members of the Hebrew Israelites, were seen taunting the much younger Covington Catholic High School students with threatening and disparaging comments and shouting racist slurs at the students and at the participants of the Indigenous Peoples Rally. Major news outlets, such as the Associated Press and CNN also covered the incident, but have not been named in a lawsuit.